One of the most intimidating and dominating defensive linemen of his era of college football, Russell Maryland left a legacy of excellence that few will ever match. The first Miami player to win the coveted Outland Trophy (nation's top interior lineman) in 1990, Maryland captured virtually every award in his grasp during his outstanding senior season. A consensus All-American in 1990, Maryland was a first-team All-America selection by Associated Press, United Press International, Kodak, the Walter Camp Football Foundation, The Football News, and The Sporting News. He also was the UPI's selection as 1990 College Football Lineman of the Year. Maryland, who finished his UM career with 279 tackles, 25 tackles for losses and 20.5 quarterback sacks, was UM's Jack Harding Most Valuable Player Award winner in 1990. 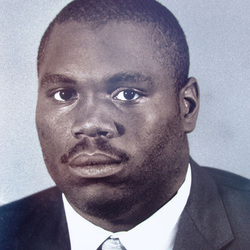 Maryland, also an excellent student, was inducted into UM's elite Iron Arrow fraternity before his graduation and was the first player chosen in the 1991 NFL Draft (by the Dallas Cowboys). A native of Chicago, Illinois, Maryland remains an active pro player for the Green Bay Packers. He also played for Dallas (1991-95) and Oakland (1996-99), winning three Super Bowls with the Cowboys.